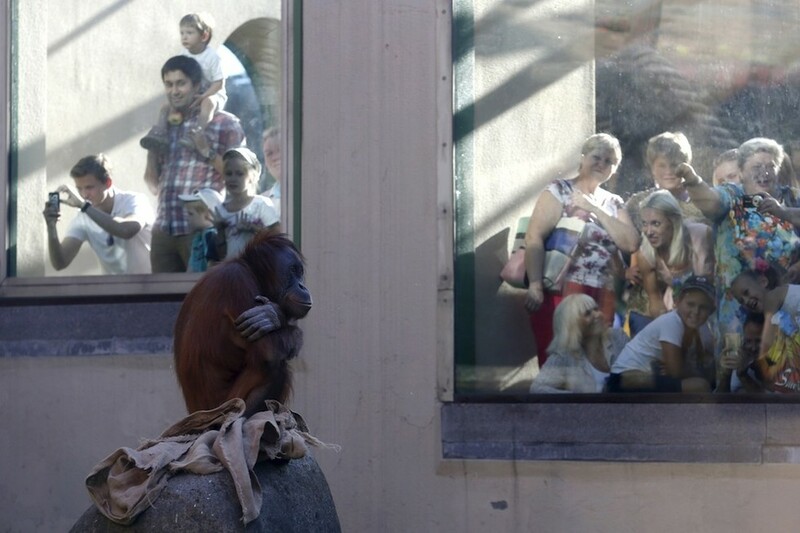 I know that zoos play a huge role in education and conservation of species. I’m not knocking them here. I do want to raise the question if apes and other sentient creatures should be displayed in such enclosures as the one seen above. Are there other ways of doing things? What turns out to be a few minutes of observation for the tourists is actually a lifetime in captivity for the orangutan above. Orangutans live nearly their entire lives in the trees where they feel safest and can best avoid detection. Looking directly at an ape of any species is a threatening display for them, a direct challenge. I wonder how the apes deal with being stared at in the wide open so often. Do they eventually become numb to it? Do they emotionally shrink until they feel dominated? It must be at least uncomfortable. A little known fact is that the largest known ape, the mountain gorilla, does not survive for very long in captivity. Every gorilla you’ve ever seen in a zoo has been a lowland gorilla. It is unknown why mountain gorillas do not survive in captivity, but speculations include specific dietary requirements and the high levels of stress associated with living in enclosures. I think that after academic acceptance of the sasquatch, it will be a natural inclination for our species to try to keep one or more of their species in captivity. This will probably eventually be in a zoo setting, though it might not start out that way. No matter where they are kept, I think problems will ensue. First off, I suspect that sasquatches would not fare well in captivity, probably due to the above reasons mountain gorillas don’t survive (diet and stress). I think an example of this can be seen in the story of Jacko, the juvenile sasquatch captured outside of Yale, British Columbia in 1884. If this story is real, the sasquatch is thought to have died while in transit to the east. It is very possible the sasquatch could have died from harsh treatment by its captors, but diet and stress seem just as likely. Secondly, I sometimes ponder what it would take to keep a sasquatch in captivity. I’m not so sure it could be done for very long, and no enclosure I have personally seen in a zoo would do the trick. Even now, apes occasionally escape their enclosures. How would one keep a 900 pound ape with intelligence that approaches our own and physical abilities that far surpass anything we know in captivity? These things run frighteningly fast, jump high and far, climb like an ape (go figure), learn patterns quickly, and are stronger than we can imagine. Any sasquatch that wanted to escape would certainly start to learn how to do so after watching their captors enter and exit the enclosures a few times. Sasquatches spend much of their time in the wild observing. They seem to have an amazing ability to learn about the patterns of humans who invade their habitat which enables them to avoid us so easily. After a brief period of trial and error, a sasquatch would figure out a way to escape and then all hell would break loose among the humans, probably resulting in a dead bigfoot. One of the many benefits of not being “discovered” yet is that the question of putting sasquatches in zoos isn’t even on the table. However, this question will eventually have to be grappled with, and I would encourage a moral soul-searching before any decision is made. It reminds me of the 1984 movie, “Iceman.” You can watch Iceman for free at this link. If you do, just switch out a neanderthal for a sasquatch and ponder the implications. For past thoughts on this topic, you can read previous blog entries here and here. The photo of the orangutan above was taken from this article.